When you’re listening to the radio and you turn up the volume on a song you like, after a short period of time, the music does not sound as loud as it did when you first turned up the volume. Even though you have not touched the volume knob, the music does not sound quite as loud to your ears. What you have experienced is a very common phenomenon associated with your senses: the phenomenon known as habituation. Habituation occurs when the physical stimulation that is originally experienced from an environmental stimulus is perceived as being less intense over time. This happens very regularly, and most often, as is often the case in the above example, people turn up the intensity once they are habituated to the stimulus, in order to keep experiencing the effect originally produced. For example, after you have been listening to the radio for short period of time and the song does not sound as loud as it did when you first turned it up, you increase the volume again. Eventually, you may turn the volume up as high as it can go. The physiological response that occurs associated with habituation consists of a reduction in the rate of nerve impulses due to prolonged exposure to a stimulus. Nerves and neurons in the brain always fire with at their maximum strength (the all or none principle); however, differences in the intensity or effects of the stimulus are due to different numbers of neurons/nerves being activated or the decrease in the rate of firing of the neurons/nerves as a result of prolonged exposure. Tolerance represents a form of habituation occurs with the use of drugs or medications. Initially, a person will experience sufficient effects of the drug at a low dose; however, over time, for many different types of medications or drugs, people find they need to increase the dosage of the substance/medication in order to achieve the same effects initially produced. Developing tolerance to a drug is not always a bad thing. In fact, for certain classes of drugs, it is often expected. Tolerance is, however, one of two criteria that one must display in order to have a physical dependence on a drug. The other criterion is having withdrawal when one stops taking the drug or reduces the amount of the drug. Many different drugs in the same class of drugs, such as narcotic painkillers (e.g., Vicodin, OxyContin, morphine, heroin, etc.) are very similar in chemical structure and affect the same group of neurons in the brain. Because drugs in the same or similar classes work on the same aspects of the central nervous system, it is quite possible to develop a cross tolerance to drugs in the same class. For example, a person using a narcotic pain medication such as Vicodin could very easily need higher doses of similar medications than would normally be given to someone else in order to experience pain-relieving effects. Thus, individuals who take to medications that belong to the same class of drugs could eventually develop a cross tolerance, such that if one is prescribed Xanax for anxiety and then prescribed Ativan, one may already have developed tolerance to Ativan. When one has developed cross-tolerance, the person has essentially developed a form of habituation to closely related drugs; however, in most cases, this is not the case with drugs that are dissimilar. For example, if a person develops tolerance to stimulant drugs, it is highly unlikely that the person would develop cross-tolerance to narcotic drugs, benzodiazepines, or barbiturates. Moreover, even though some drugs produce very similar effects, such as Valium and heroin, these drugs operate on different neurotransmitters in the brain. As a result, it is highly unlikely that a person would develop cross-tolerance to heroin by using Valium. Benzodiazepines, barbiturates, and alcohol all affect the same transmitter system (GABA), and someone using drugs from these different classes may develop a cross-tolerance. Benzodiazepines, barbiturates, alcohol, and sedatives also share similar mechanisms of action, so a person taking Ambien for sleep for a sufficient period of time might conceivably develop a cross-tolerance to other similar drugs. Stimulant medications, such as Dexedrine, Ritalin, and so forth, achieve their effects by primarily affecting dopamine neurons, which are also primarily affected by stimulants such as caffeine and nicotine. Thus, there is the potential to develop a cross-tolerance for caffeine from regular use of a drug like Ritalin or other stimulant medication. Interestingly, alcohol appears to have a potential to produce cross-tolerance with some dissimilar drugs such as nicotine. Thus, alcohol use may contribute to cross-tolerance to many drugs. 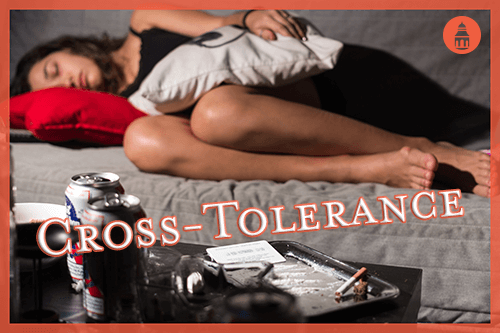 Who Is Likely to Develop Cross-Tolerance? Individuals who are prescribed drugs from the same or similar classes or who take drugs of abuse from the same or similar classes (e.g. Vicodin and OxyContin; Xanax and Valium) are more likely to develop cross-tolerance. Certain classes of drugs share similar effects and are also potential candidates for cross-tolerance. For instance, individuals who use alcohol with anti-anxiety medications or sedatives (benzodiazepines, barbiturates, and sedatives/hypnotics) will potentially develop cross-tolerance. Individuals who mix drugs that have highly dissimilar actions, such as using stimulant medication with narcotics, should not experience significant cross-tolerance; however, there is research that suggests that alcohol use may be associated with cross-tolerance to some drugs with dissimilar actions.